Boeing and Airbus are holding a paper airplane contest. A very expensive one. And the winner may get the chance to build the world's longest jet. The U.S. and European aerospace giants are vying for a coveted spot in the fleet of Singapore Airlines. By the end of the year, the airline is expected to back one of the company's designs, according to three people familiar with the campaign. There's a "pretty fierce campaign for this" order from Singapore, said one of the people. At the moment, the Boeing (BA) and Airbus planes exist largely as PowerPoint presentations that are being evaluated by engineers at Singapore Airlines. Both planes would be the longest twin-aisle jets ever built and the biggest with just two engines. Nose to tail, they'll be nearly the length of a football field. Airbus' A350-2000 would be nearly 258 feet long and seat 400 passengers. 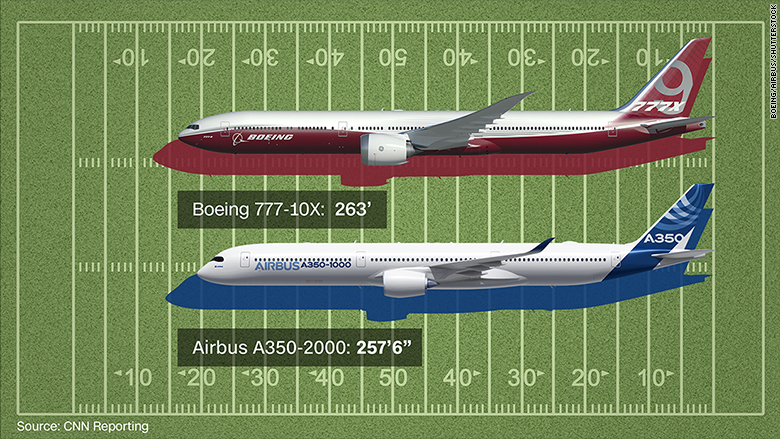 Boeing's 777-10X would be 263 feet and hold 450, in standard arrangements. That's about 30 and 50 passengers more, respectively, than the current largest A350 and 777X jets. While both jets may earn the title of world's longest, they won't carry the most passengers. The four-engine Airbus A380 has the distinction of being able to hold more passengers than any other airliner, carrying about 550 people on two decks. Boeing's new design would put it within striking distance of the A380 and even its own iconic 747 jumbo jet. Both have suffered from slow sales and declining production. And the new 777X would also have the advantage of being able to fit into airports that can't accommodate the A380 and its gargantuan wingspan, while carrying nearly as many passengers. The 777X wingtips will fold upwards after landing, so the plane will fit into the same gates and use the same taxiways as today's 777s. The wingspan on the A350 is slightly smaller than the 777X. The first model in Boeing's 777X lineup begins flying passengers in 2020. The A350 entered service in 2015. Additionally, both designs would stretch the fuselages to make room in the cabin for more seats, and move galleys used for food preparation to under the passenger cabin floor. The current versions of these Airbus and Boeing planes are priced at $355 million and $400 million, respectively, and the new, bigger jets will undoubtedly be more expensive. However, airlines get steep discounts from those published prices. Designs from Boeing and Airbus are getting longer and longer. Singapore is weighing all the attributes of each jet as it decides on which to back. The tricky part for designers at both manufacturers is to make sure that the jets don't get so long that they require more runway to takeoff and land, which would limit where they can fly and how much they can carry. The longer a jet gets, the more engineers have to account for the increased weight and length. Without more thrust from the engines or added lift from the wings, pilots will require more runway as they accelerate for takeoff. It might be harder for Airbus to provide enough thrust from its Rolls-Royce engines to accommodate the longer and heavier jet, said Richard Aboulafia, vice president of analysis for the Teal Group consultancy. Airbus and Rolls have already revised the A350's engine once, and the Boeing 777X may already hold an inherent design advantage with the new General Electric engines and larger wingspan, he said. "We are always working in partnership with Airbus to ensure that the A350...continues to address all airline requirements," a Rolls-Royce spokesman said in a statement. However, Aboulafia said Airbus does not have big new development plans for after 2017 and could bring the A350-2000 to market sooner than Boeing, which has its lineup planned through 2021. Singapore's decision to back one plane or the other doesn't guarantee that either the Boeing or Airbus design will be developed. But an endorsement from Singapore will give the model the credibility a new product needs to help win deals with other airlines. Boeing and Airbus must demonstrate to their boards of directors that they have enough buyer interest before they can begin manufacturing. "We discuss fleet requirements with manufacturers on a regular basis, and any such discussions are confidential," said Nicholas Ionides, Singapore Airlines vice president of public affairs. 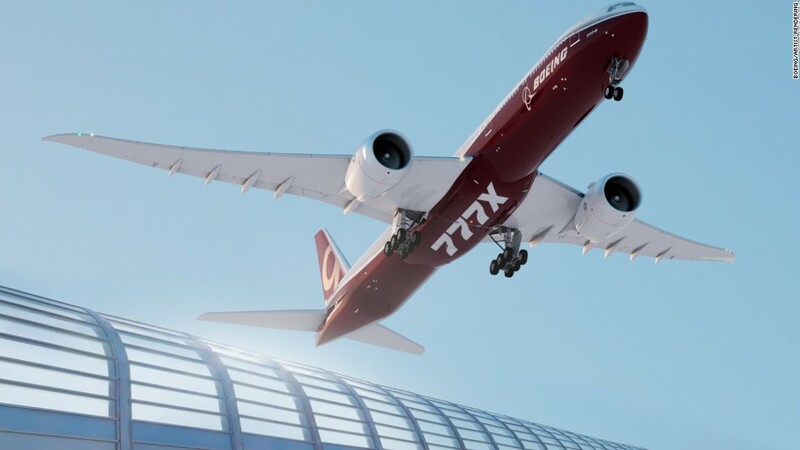 A Boeing spokesman said, "we will continue to study 777X derivatives and seek customer input to develop products that provide the most value for customers," but stressed that no decisions have yet been made. An Airbus spokesman declined to discuss any ongoing sales campaigns. Both plane makers have been rolling out the red carpet for Singapore. A year ago, Airbus launched an ultra-long range version of the A350 for Singapore for non-stop flights to New York, and in October, Singapore got Airbus's 10,000th delivery. The airline already has ordered more than 65 A350s. Boeing is set to hand over its even-larger 787-10 Dreamliner first to the carrier in 2018.